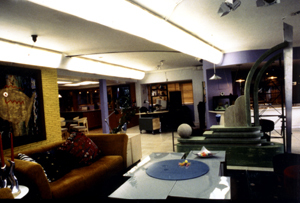 The Living Room in the Rivo Alto Island House during the filming of the series. This picture was taken from the Living Room looking west towards the Kitchen and Office. In this picture, you can see the studio lighting that was installed along the ceiling.